BuyKerala.Properties (hereafter “BuyKerala“) is an exclusive real estate portal for Kerala. “BuyKerala” caters to residential, commercial, industrial and agricultural properties within the state. Showcasing the finest of Kerala builders and individual properties,”BuyKerala” is an ideal platform for buyers and sellers to connect and conduct business. Free listings are accepted from individuals and builders who wish to sell/rent their properties within Kerala. “BuyKerala” is designed on an intuitive and user friendly platform that allows ease of use. “BuyKerala” portal offers a superior search experience that allows the user to access relevant information easily. 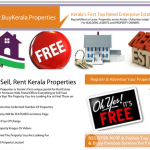 BuyKerala.Properties is a platform for Builders, Real Estate Agents, Sellers and Landlords to collectively advertise their listings on the Internet. It also serves as a resource base and medium for prospective buyers across the globe who wish to search for land/property in Kerala. Listings on “BuyKerala” portal can also be enhanced by images, photogallery, video etc.”BuyKerala” also offers vantage advertising positions to builders as well as high impact packages for promotion. Check FAQ page for better guidance through the site. Get in touch with us for all feedback and suggestions. Email: propertymanager@buykerala.properties. You can also use the Contact page to send us your requests, feedback and other information.